With billions of devices being connected to each other soon in the IoT, the “Internet of Things” Smart Home, will drastically change our lives. In order to control a wide variety of actors and sensors connected in a Smart Home environment voice is the most convenient UI. 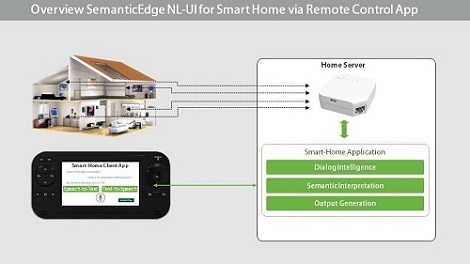 The SemanticEdge Natural-Language Voice User Interface (NL-UI) for Smart Home offers a complete solution for integrating an interactive natural-language user-interface into existing IoT-platforms. It consists of two main components: the Interpretation and Dialog Platform and the SE Dialog Client. 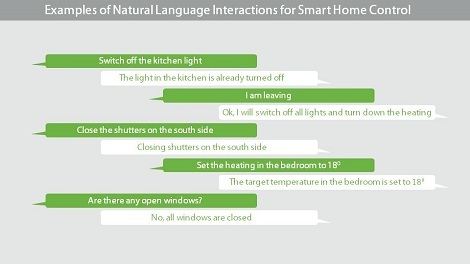 The SemanticEdge NL-UI for Smart Home provides speech recognition, natural-language interpretation and interactive dialog functionality covering the key actors and sensors and their main control use cases.